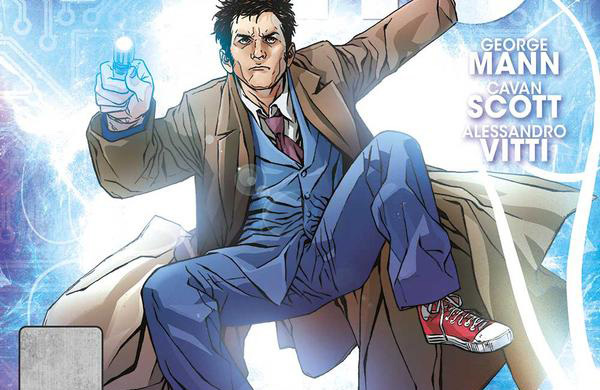 Doctor Who: SUPREMACY OF THE CYBERMEN #3 Review | Warped Factor - Words in the Key of Geek. Tony’s looking for artistic supremacy. That doesn’t really explain what’s going wrong on the Supremacy of the Cybermen comic-book series though. First of all, let’s focus on what’s not going wrong. George Mann and Cavan Scott, both strong Who writers in their own right, and both with at least one Doctor under their belt in terms of specialised comic-book series, know their Who history, and bring it to bear in the storytelling – whether in a series of prologues which have been tacked onto single-Doctor comic-book releases, or in terms of the main thrust of the story. Here, we’ve got the return of a second Hell Bent character, and one who makes sense given the events we’ve witnessed so far. 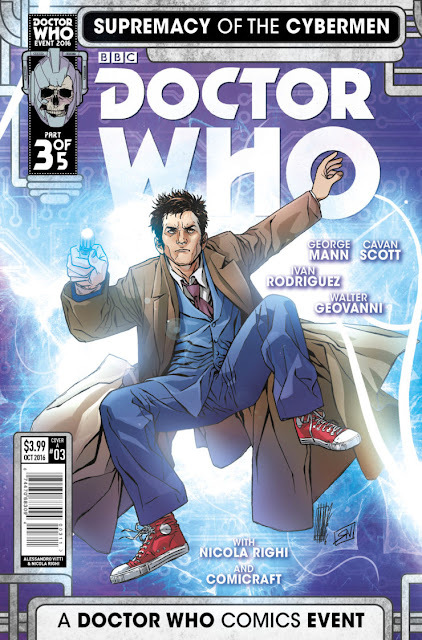 There’s a great mention of an eighties location with the Twelfth Doctor, a sneaky Cyber-downgrade in a flashback with the Tenth Doctor (Return of the Cybus design), a great Star Wars gag from the Ninth Doctor and multiple chimes of the Cloister Bell, which, through a fairly accurate approach to lettering, means you can legitimately say this comic book has a collection of very splendid dongs in it. The Eleventh Doctor reminds us that Silurian sleep-chambers double as very effective Cyber-tombs, while the Tenth is involved in some battle action between the Sontarans and the Cybermen – don’t tell us you never had a dream about that kind of fan-story! And finally, as the tension and the pace ramps right the hell up, we get an idea of what happens when all the talk of Cyber-supremacy hits a little close to home. So, as issues go, this one delivers the goods, storywise. It’s when you actually see it that things start to go skewiff. Understand us well – Ivan Rodriguez and Walter Geovanni can draw. They can draw well – skies full of Cyber-ships, no problem. Skies full of Cybermen, no problem. Full-on action battles between two of Doctor Who’s top-flight villain-races – they’re your go-to guys. Glorious poster-style panels full of might-be histories, gloomily magnificent Silurian sleep-chambers, and the Silurians generally? Pretty damned kickass. What you shouldn’t look to them for is ability to draw the Doctor. Which is a bit of a nuisance when they’re assigned to provide the artwork on a story that involves at its core four Doctors, and has a bunch of others appearing in alternative history panels. It’s unusual to find a Titan Who comic-book in which really not a single panel featuring the Doctor seems to actually feature the Doctor, but rather some terribly dedicated but, with the best will in the world, not-really-very-like-him cosplayer. But essentially that’s where this issue leaves us as fans – the story’s tight, and starting to make some strides towards a resolution, and the panoramic battles and architecture and ideas displayed in the visuals all help push the urgency and the punch of that story. But when you look at the most familiar figures in the panels, they look like not-quite-finished, or sometimes just plain wrong versions of the Doctor, as though we’re watching Doctors from the Unbound Universe dress up in costumes and pretend to be our Doctors for some reason. Actually, it’s not just the Doctors. Jackie and Rose Tyler, Captain Jack and one other character we’re not going to tell you about could pretty much be anybody. Anybody, that is, except who they’re meant to be. Does that matter? Doesn’t the story pull you through, and isn’t the story really what you read comic-books for? It probably shouldn’t matter, and yes, the story’s absolutely strong enough, but truth be told, we read comic-books for both the story and the visuals – if the visuals weren’t important, they wouldn’t be there, which would leave us with…well, plays, essentially. And here, it feels as though the story and a key element of the visuals are in conflict, battling for control of our attention, and too often the not-quite-rightness of the Doctors distracts, like one blown pixel in a TV picture – the rest of what’s being shown may be awesome but your eye, and eventually your mind, keeps getting drawn back to that element of wrongness. So – one to avoid then? Well, no of course not – you’re got George Mann and Cavan Scott writing a multi-Doctor story for you, in which the Cybermen rule all, you’d be a fool not to let your mind conjure with what they’re giving you. But perhaps with this miniseries, it’s best to read it, then re-imagine it in your mind, with the visuals, and most especially the Doctors, in your head.